An Artist in the House? 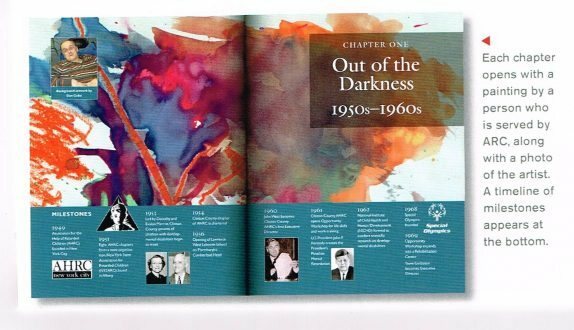 In all corporate history campaigns, we urge clients to “seek out the talent under your own roof.” A good example is the chapter opening art in CorporateHistory.net’s 55th anniversary book for Clinton County ARC in upstate New York, a nonprofit that serves people with disabilities. On our first day of research there, we saw amazing art framed on the walls. It had been done in art classes. Several artworks ultimately went into the book, along with photos of the artists. Having their achievements commemorated in print became a source of pride for ARC individuals and their families, community supporters, and staff members. We’ve found that artists, photographers, and writers exist in every organization, whether or not those things are in a person’s job description. Put out the call and you’re likely to gather materials that can enhance your timelines, videos, About Us pages, and other corporate history campaign components.